Welcome to the EUROMOBIL website! EUROMOBIL is a multimedia language learning and information programme promoting student mobility. At this site you will find demo exercises from the language learning programmes as well as information on the target countries and the project. 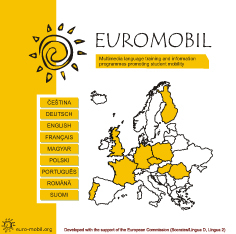 Information on the EUROMOBIL-programmes, their contents, downloading and ordering. Here you can also give us some feedback and take a look at some samples of the EUROMOBIL-programmes. Information on study possibilities, libraries, services, things to do in your free time in the Czech Republic, Finland, France, Germany, Great Britain, Hungary, Poland, Portugal and Romania as well as general information on the countries and their cultures.